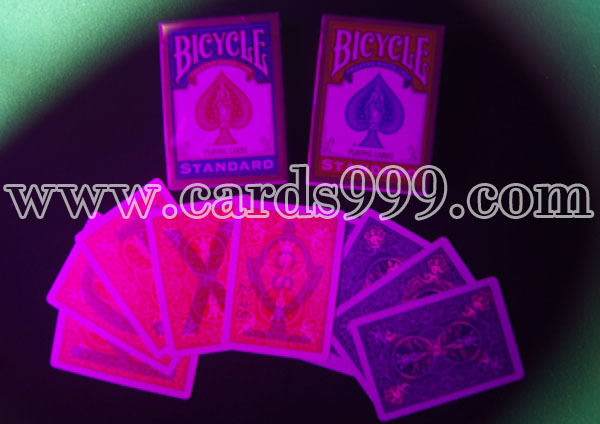 Bicycle marked cards, are quite popular in America and Canada. Only poker players wear our UV or IR contact lenses, and marked plaing cards with glasses, luminous marks can be viewed. It can also be processed into lateral barcode marked cards and this marks can be read by Omaha scanner system and Texas Hold'em poker analyzer. Also can be processed as infrared marked cards, and you can use infrared camera to see the marks (remote control in long distance). All kinds of marks are available.